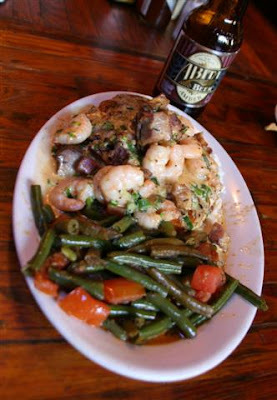 Coop’s is our go-to place in The Big Easy. The hip little dive bar on Decateur is anchored by a giant church pew, and made homey by a little cat in the window. The service is fast, the music is good, and the bartenders are a little wild. Opened by Jeffrey “Coop” Cooperman, an avid fisherman, in 1983, Coop’s is truly a local hangout. 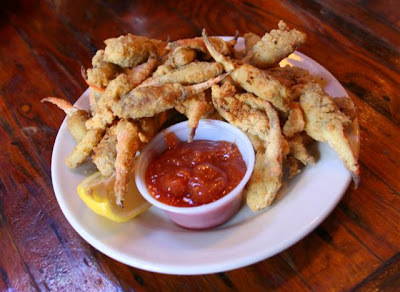 The must-order dishes are deep-fried crab claws served with a fiery horseradish cocktail sauce and jambalaya made with chicken, sausage and rabbit, and the killer Pasta Opelousas. 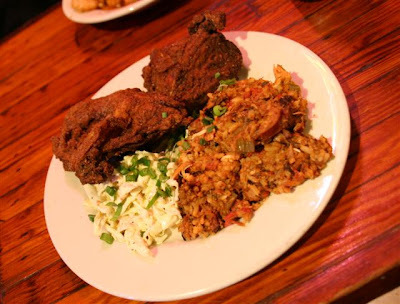 The combo plate is a good choice for trying the jambalaya, along with crispy fried chicken. It looks overcooked in the photo, but it’s just right. Heat oil. Add garlic, chicken, tasso, and mushrooms. Saute 2 minutes. Deglaze pan with white wine. Stir until wine reduces to 1 Tablespoon. Add shrimp and saute for 2 minutes. Add heavy cream and Bayou Blend. Cook until liquid thickens. Add green beans. Simmer 1 minute. Add fettuccine to the pan. Mix well. Serve garnished with green onions. This entry was posted in bars, Cajun, New Orleans. Bookmark the permalink. Live 10 blocks away from Coop's but can't go there with the baby. 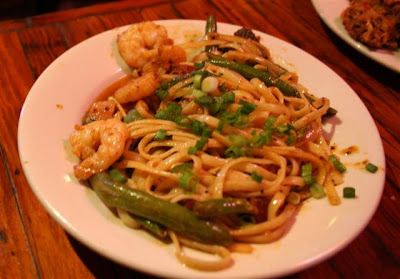 Had a mad hankering for Pasta Opelousas. Thanks for posting the recipe!!! I'm wondering if the cookbook has the recipe for redfish munire? It is the best! Where can I find Cookin with Coop? Hi,I read your blog named “Coop’s Place | Here, Eat This! The Adventures of Kiki Maraschino” like every week.Your humoristic style is witty, keep it up! And you can look our website about love spell.